As self-appointed curator of the Overtom Chess Computer Museum, I often need to find out the playing strength of chess computers that are new to the collection. With older and stronger chess computers, this is usually no problem. There are long lists with the ELO ratings of strong computers. But details about weaker devices are usually few and far between. Especially the newer ones often come without any information at all about ROM, RAM or processor speed. So it's impossible to predict how strong the computer will be. It is not a very good idea to test them by playing games against them: if you test a chess computer, you should concentrate on the testing, not on playing a game. Besides, humans tend to make mistakes, and you don't want a computer to be called intelligent just because of your mistakes, do you? It would be nice to have a kind of standard player. I have found this standard player in the form of Fritz at a level of one ply (thinking no more than one move ahead). 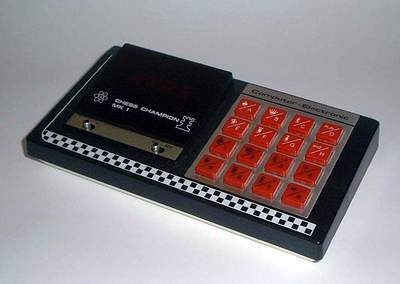 Let's have a look at a notoriously weak one, Chess Champion Mk 1, which played a part in the previous weblog . In the following game, you can clearly see how undeserved the name Champion really is. Chess Champion Mk 1 is not the only weakling in the Overtom Collection. Another suitable prey for Fritz-one-ply is Krypton Micro Chess. In the opening it's generally good practice to develop one's pieces and not to advance too many pawns. Black seems to believe in the contrary. Soon he wiill find out how wrong he is. Everybody who knows a little bit about chess can see how weak these two computers played. Cavalier is a reasonably good match for occasional players. But in a game against Fritz-one-ply, we clearly see it doesn't really understand much about chess. Black's 24th move is probably the losing mistake. Black should have played 24...Rf8 to prevent white's occupation of the 8th row. From then on black can't get his rook and knight into the game. Not really what one would expect of a computer of less than twenty dollars! If you want to see some more games played by this inexpensive but surprisingly strong computer, you can look here .